Now, This is Podcasting! now has Video! We are now filming each recording of Now, This is Podcasting! Each week we will have the Episode VII news up on YouTube and most weeks, we will have the entire video online for you to watch. You can watch our Star Wars: Episode VII news and discussion video here. 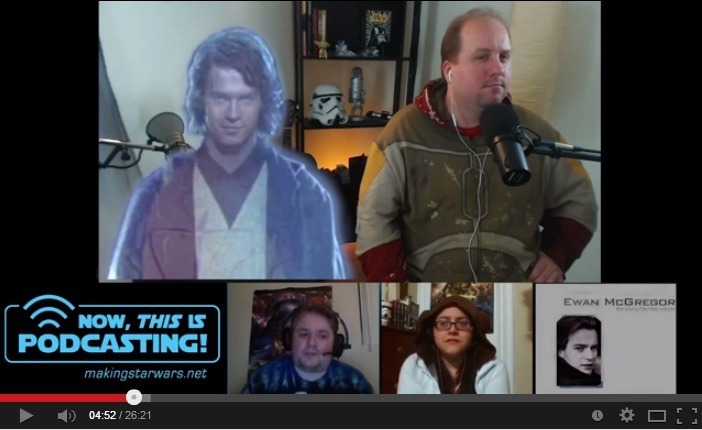 Please head to http://www.youtube.com/MAKINGSTARWARS and subscribe to our channel for video podcasts and interviews! The show as it is today is somewhat rooted in impatience. We have high quality digital cameras coming within the month and the layout will be streamlined. In many ways, the next few shows are the “pilot” for what the video editions of Now, This is Podcasting! and what it will become in the future as we get better at harnessing the technology and we pick up better tools to pull off multiple angles and shots. If the quality leaves anything to be desired, that should be a temporary issue which we will work out. Later in the week, the videos for our discussions on Star Wars: The Clone Wars, Star Wars Rebels. and Pod People (community questions) will follow!